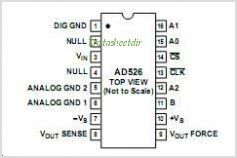 The AD526 is a single-ended, monolithic software Programmable Gain Amplifier (SPGA) that provides gains of 1, 2, 4, 8 and 16. It is complete, including Amplifier resistor network and TTL-compatible latched inputs, and requires no external components. Low gain error and low nonlinearity make the AD526 ideal for precision instrumentation applications requiring programmable gain. The small signal bandwidth is 350 kHz at a gain of 16. In addition, the AD526 provides excellent dc precision. The FET-input stage results in a low bias current of 50 pA. A guaranteed maximum input offset voltage of 0.5 mV max (C grade) and low gain error (0.01%, G = 1, 2, 4, C grade) are accomplished using Analog Devices' laser trimming technology. To provide flexibility to the system designer, the AD526 CAN be operated in either latched or transparent mode. The force/sense configuration preserves accuracy when the output is connected to remote or low impedance loads. The AD526 is offered in one commercial (0C to +70C) grade, J, and three industrial grades, A, B and C, which are specified from -40C to +85C. The S grade is specified from -55C to +125C. The military version is available processed to MIL-STD 883B, Rev C. The J grade is supplied in a 16-pin plastic DIP, and the other grades are offered in a 16-pin hermetic side-brazed ceramic DIP. This is one package pinout of AD526,If you need more pinouts please download AD526's pdf datasheet. 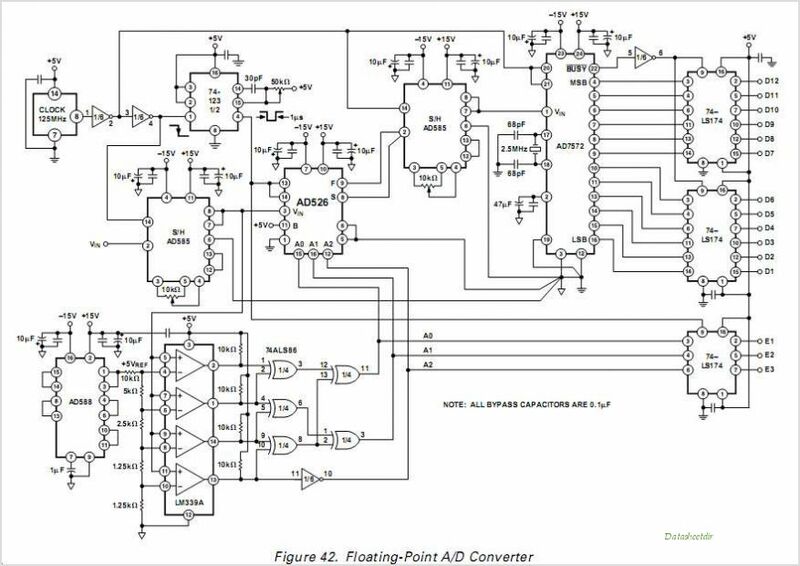 This is one application circuit of AD526,If you need more circuits,please download AD526's pdf datasheet.